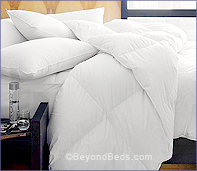 850 Fill Power European 90% White Goose Down Comforter, sewn through baffle box construction allows the down to breathe, providing maximum loft for added comfort. Oko-Tex certified 350TC down proof German Milled Batiste cotton covering. If you are looking for a high quality luxury goose down comforter OBS has just narrowed your search, You’ll welcome this 850 Fill Power Down Decor® comforter. Down Decor®, is a most reputable family owned business. They have been manufacturing and importing quality bedding for over 100 years. We spend Almost one-third of our lives sleeping. Why not spend that time cradled in comfort?